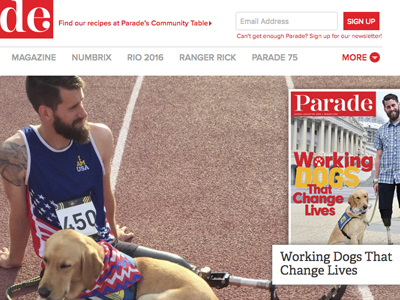 Canine Companions for Independence© is proud to have had our graduate, Stefan Leroy and his service dog Knoxville featured on the cover of Parade magazine (August 28, 2016 issue). Stefan and Knoxville were matched in February of 2016 and have been working as a team ever since. LeRoy is a retired U.S. Army veteran who was deployed to Afghanistan in 2012. Just five months into his deployment he stepped on an IED while carrying a severely injured platoon member to a medevac helicopter. The injury caused him to lose both his legs below the knee. Since receiving Knoxville, LeRoy has less to worry about with and without his prostheses. “It’s amazing how much he has impacted my life, “LeRoy says. “Knoxville has impacted the lives of everyone he meets, and it’s wonderful to have his help and support.” Knoxville has been trained in 40 commands including turning on lights, carrying items and retrieving items such as credit cards or assistive devices. Stefan’s injuries haven’t held him back. This past May, he competed in the 2016 Invictus games and participated in track and field events as well as cycling, swimming and indoor rowing. 2016 Invictus Games - Stefan LeRoy Feature from Jack McNamara on Vimeo. Congratulations to Stefan and Knoxville for the successes they’ve achieved and the great partnerships they represent. 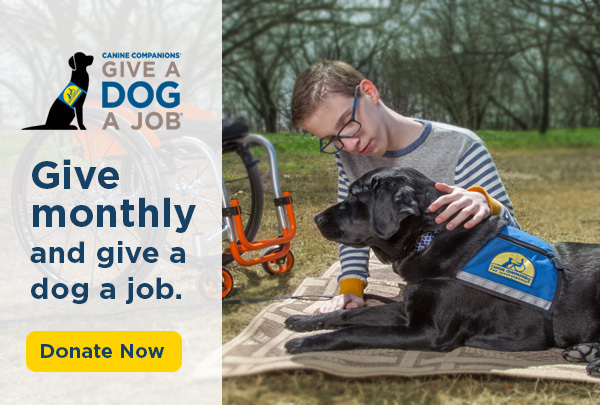 For over 40 years, Canine Companions for Independence has been enhancing the lives of people with disabilities by training and placing more than 5,000 assistance dogs with program graduates, including over 140 dogs with wounded military veterans and more than 1,500 dogs with children, entirely free of charge.